Nothing can force a team to recognize its faults better than a loss. 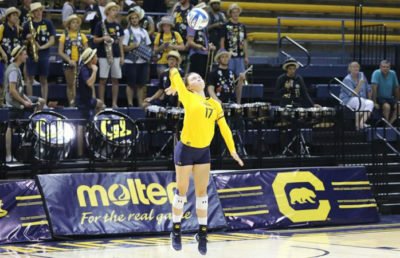 And as Cal volleyball (5-1) returns from South Dakota, where the team dropped its first match, the Bears have to acknowledge just how much space they still have to grow. Cal’s weekend was bookended by a 3-1 win over Northern Colorado and a 3-0 win over Northeastern. But the close-fought match that lay in between, against host South Dakota, ended in the squad’s first loss. 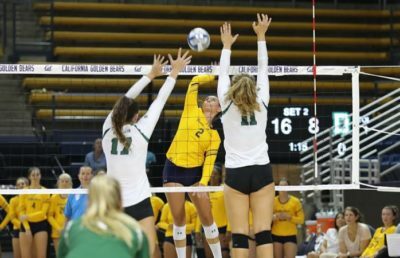 In the Bears’ first match of the weekend and first competition away from home territory, Cal and Northern Colorado got off to a close start. With strong offense — particularly from pin hitters junior Bailee Huizenga and sophomore Mima Mirkovic — the Bears managed to pull ahead and close the first set 25-20. In the second set, however, Cal lost whatever footing it had gained. 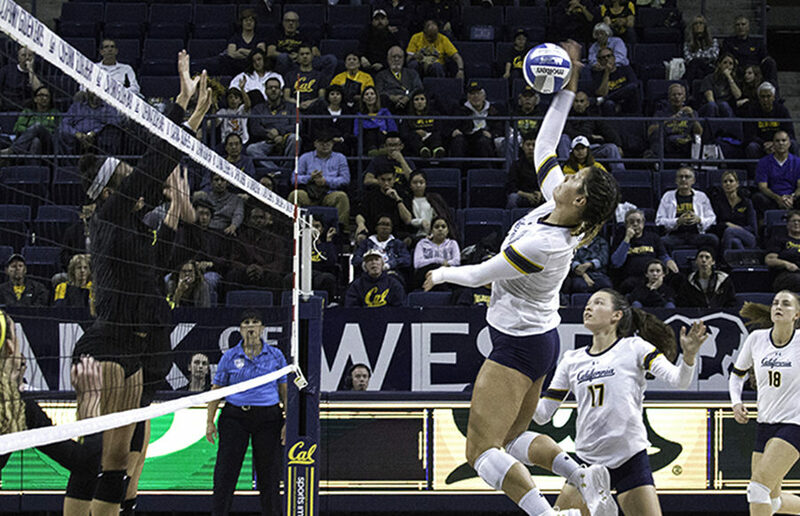 With a multitude of attack errors and three service errors, Cal gave its opponents easy points, and the set ended 27-25. Refocusing on its side of the net, Cal managed to take the following two sets, though the teams remained closely matched. 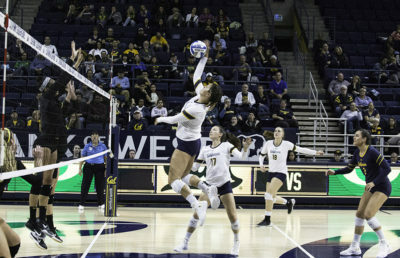 Cal toppled Northern Colorado 25-20 and 25-22. Although neither team performed particularly well — both falling below an overall .200 hitting percentage in the last three sets — Cal managed to edge Northern Colorado out with fewer errors. But in Cal’s match against South Dakota later that day, the Bears’ high number of errors would be their downfall. All four sets against the Coyotes ended with only a two-point differential, but the last three all swung in favor of the Coyotes. Despite freshman Jade Blevins’ 29 assists and sophomore middle blocker Preslie Anderson’s whopping .478 hitting percentage with 23 attempts, the Bears’ pin hitters struggled to find the court. Cal recorded 20 attack errors across its three dropped sets. While this match ended Cal’s hope for a second 3-0 tournament weekend, the team managed to get back up for its match Saturday morning against Northeastern. Perhaps even more motivated to clinch the win after Friday night’s loss, the Bears’ eagerness to pull off a 3-0 win was highlighted by Cal’s all-around performance. Offensively, the Bears hit in the .300s in each set of the match, recording an overall .364 hitting percentage, undoubtedly their new season best. Defensively, the Bears were nearly as strong, tallying up 39 digs. Even Anderson — the front row’s power source and typically a timid player in the back row — notched six digs.